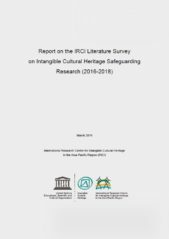 “Report on the IRCI Literature Survey on Intangible Cultural Heritage Safeguarding Research (2016-2018)” has been published online. IRCI has been collecting information on intangible cultural heritage safeguarding through the literature survey under the project “Mapping Studies on the Safeguarding of ICH”. The literature survey aims to collect basic information for research on ICH and identify important research issues through conducting a broad and systematic collection and analysis of information on existing literatures, research institutes, and researchers in the Asia-Pacific region. 31 countries and a region in Asia and the Pacific have been thus far researched and mapped. IRCI has published the programme report written in English on March 2019 online, which contains a summary of the entire project, its outcomes, lessons learned and future orientation. *The full report is available for download if you click the cover image above.